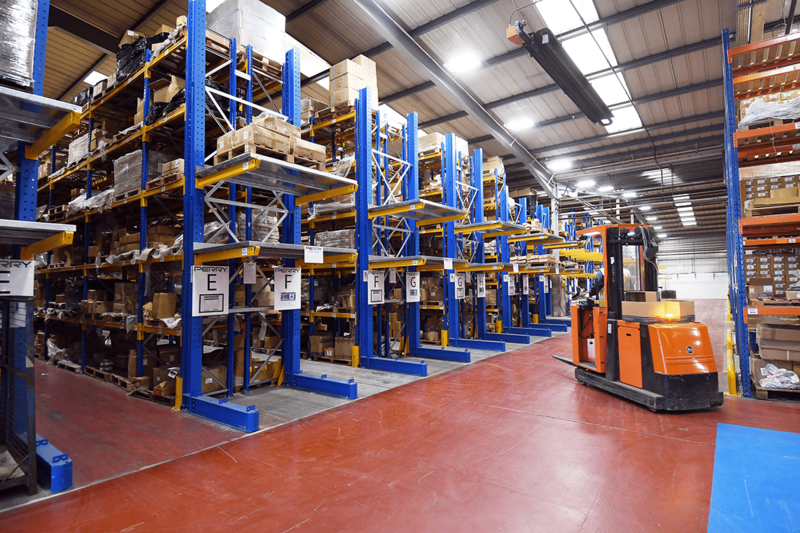 Within the facility A. Perry required a new VNA racking installation covering an area of 18130 sq ft (1,685 m2) designed to store picking and bulk storage pallet locations. 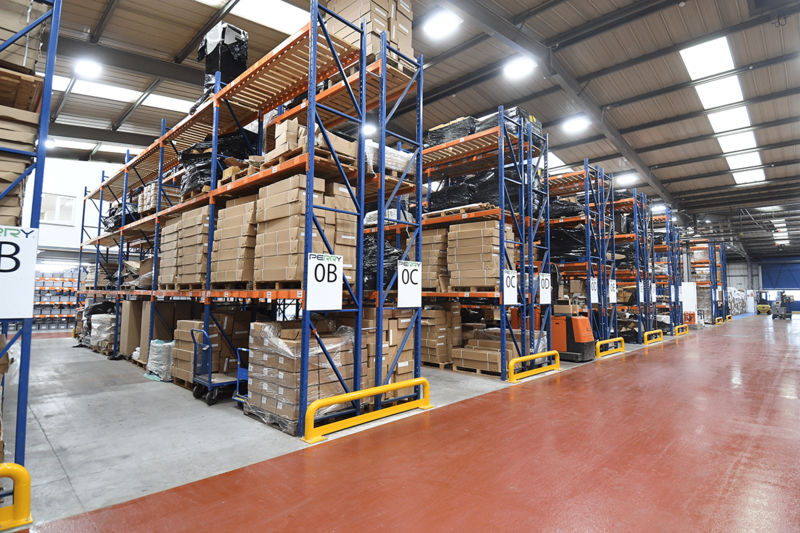 Situated opposite the VNA racking installation, the client also required a wide aisle pallet racking operation, covering an area of 6,778 sq ft (630 m2) for the storage of non- standard pallets. This racking was to be dismantled from A. Perry’s old facility, inspected then re-installed and commissioned at the new facility. Finally, two mezzanine floors were required covering a total area of 5,724 ft sq (532 m2), one to be used as a merchandise display area and the second for general storage of small handpicked goods. All works needed to be co-ordinated around A. Perry’s daily business operations, working in conjunction with the clients approved electrical and mechanical contractors. Firstly, Teepee designed a new VNA racking facility to replicate the existing onsite system, with the exception of adding ‘pick and deposit’ stations (P&D’s) fitted to one end. This enabled a standard forklift to load pallets onto the P&D’s to maximize the efficiency of the VNA forklift. In addition to the above, fitted towards the rear of the racking, a 4,000mm wide ‘drive-thru’ bay was installed to reduced forklift travel time. Once Teepee explained to A. Perry the advantages of doing this, new specially designed P&D racks were also fitted to the existing racking which was remaining in situ. Prior to re-locating the existing racking and installing two new mezzanine floors, Teepee provided a concept layout of the complete warehouse facility. This enabled the management team to review current operations and with assistance from Teepee, provided an efficient and cost effect design to future-proof the business minimising the need for unnecessary, costly alterations, in the event of future expansion. During the installation of the new VNA and re-location of the existing racking system, Teepee installed end-of-aisle protection barriers to the extreme ends of all racks and ‘drive-thru’ sections, including fitting upright protection guards to any critical uprights. Not only did this provide a safe working environment for employees, but also reduced expensive repair costs. Before commencing manufacture of the mezzanine floors, Teepee obtained Building Regulations approval on behalf of A. Perry, allowing the management team to concentrate on daily operations. 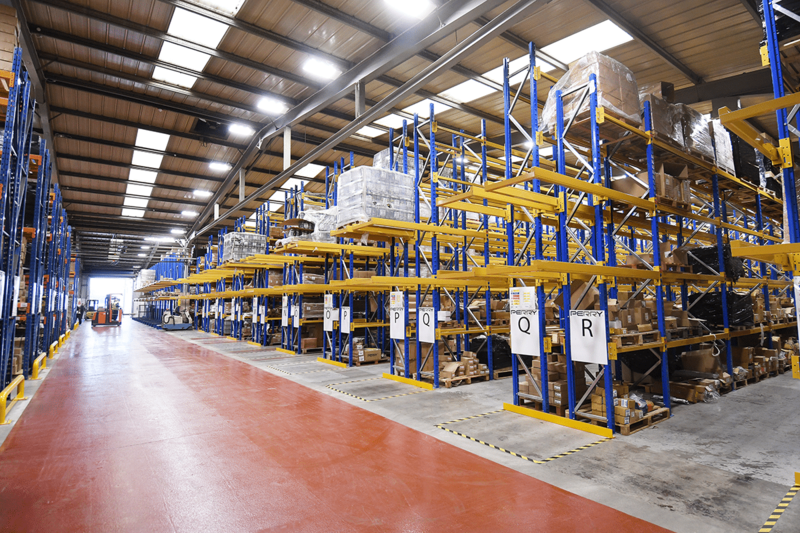 VNA racking facility capable of storing in excess of 9000 no. pallets. P&D’s fitted to existing racking to improve operational efficiencies and store an additional 52 no. pallets. 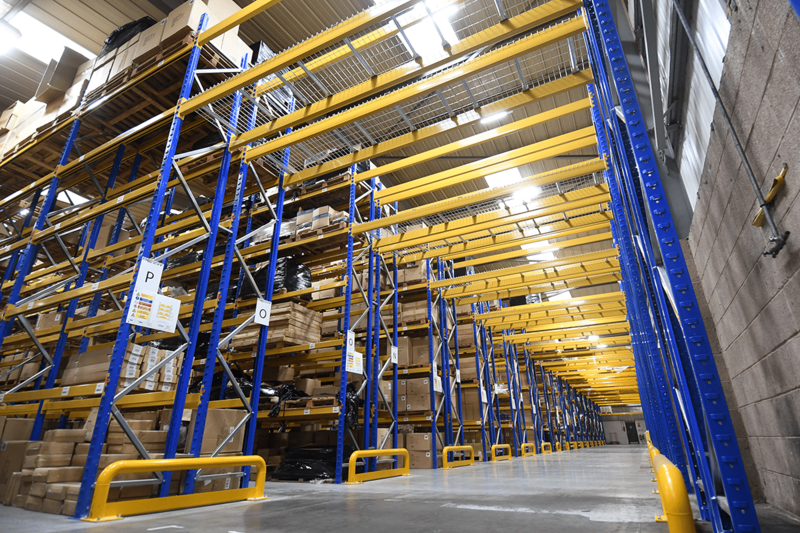 Existing racking re-sited and re-commissioned to SEMA standards to create an additional 770 no. pallet locations. End of aisle racking barriers fitted throughout, to ensure safety of employees and minimise repair costs. Mezzanine floors provided an additional 5,734 sq ft (532 m2). Business Established in 1925, A. Perry is still a family owned and run company that has become the largest UK supplier and manufacturer of hinges, ironmongery, chain and threaded bar, available through a network of wholesalers and distributors across the UK, Ireland and Europe. Our Brief After years of growth and acquisitions, A. Perry acquired a 100,000 sq ft (9,293 m2) manufacturing and distribution facility located within Cradley Heath, West Midlands. Our remit was to design, supply and install a new storage solution.